FLIR Systems, Inc. (NASDAQ: FLIR) announced today it has received an award from the United States Department of Defense (DOD) Joint Program Executive Office for Chemical Biological Radiological and Nuclear Defense (JPEO-CBRND) in support of the Multi-Phase Chemical Agent Detector (MPCAD) program. The Other Transaction Authority Agreement (OTA) is valued at $28.7 million, with execution extending through mid-2022. A modified version of the FLIR Griffin™ G510 will form the basis of FLIR’s MPCAD solution. 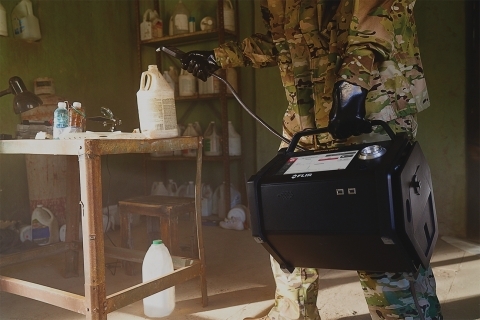 The Griffin G510 is a portable gas chromatograph mass spectrometer (GC-MS) system currently used by domestic and international response teams to perform real-time chemical threat confirmation in the field. This development will provide the ability to identify chemicals at low levels in aerosol, gas, liquid, and solid phases of matter. It will provide the warfighter with field confirmation capabilities and better enable the Joint Forces to combat and interdict chemical weapons of mass destruction (WMD). Work under the contract is expected to be performed at FLIR’s facility in West Lafayette, Indiana, US. For more information about the FLIR Griffin G510, visit www.flir.com/G510. The statements in this release by James Cannon and the other statements in this release about the contract and order described above are forward-looking statements within the meaning of the Private Securities Litigation Reform Act of 1995. Such statements are based on current expectations, estimates, and projections about FLIR's business based, in part, on assumptions made by management. These statements are not guarantees of future performance and involve risks and uncertainties that are difficult to predict. Therefore, actual outcomes and results may differ materially from what is expressed or forecasted in such forward-looking statements due to numerous factors, including the following: the ability to manufacture and deliver the systems referenced in this release, changes in pricing of FLIR's products, changing demand for FLIR's products, product mix, the impact of competitive products and pricing, constraints on supplies of critical components, excess or shortage of production capacity, the ability of FLIR to manufacture and ship products in a timely manner, FLIR's continuing compliance with U.S. export control laws and regulations, and other risks discussed from time to time in FLIR's Securities and Exchange Commission filings and reports. In addition, such statements could be affected by general industry and market conditions and growth rates, and general domestic and international economic conditions. Such forward-looking statements speak only as of the date on which they are made and FLIR does not undertake any obligation to update any forward-looking statement to reflect events or circumstances after the date of this release, or for changes made to this document by wire services or Internet service providers.